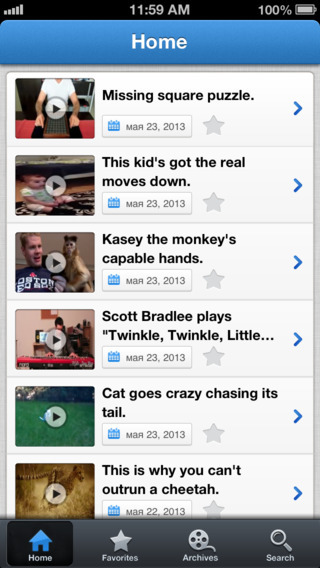 You can now enjoy all of the interesting, emotional, funny, and educational videos you love on Wimp.com - on the go with your iPhone, iPad, or iPod touch! Browse the latest videos, check out our archive of thousands of available clips, search and save your favorite videos to watch at your convenience... and more! 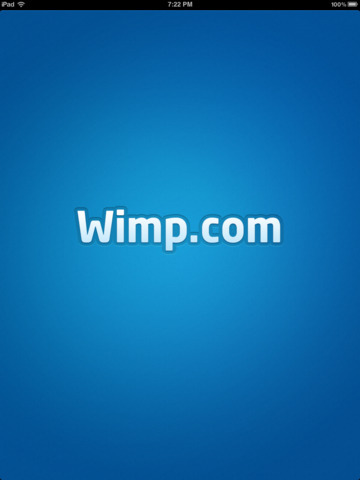 The Wimp.com app is absolutely free and 100% family friendly, so what are you waiting for? - 100% family friendly videos. - Anti-sensationalistic, which means even Grandma won't cringe using this app. - Explore or revisit our massive archive of interesting videos. - Looking for an older video? 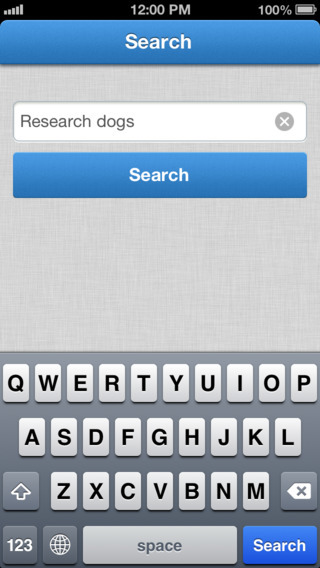 Our intuitive search feature makes finding clips a breeze. - Save videos on the app for later viewing. - View more information about an author of a video. - Share your favorite videos through email, on your Facebook wall, Twitter page, or copy the link to use in a separate app. - Attempt to fix a network connectivity problem that many users are experiencing. - Modified and improved images in the tab bar for non-Retina display devices. - Copy Link button now fetches the entry's title along with its respective URL. We've gone through your feedback and we are proud to present the next version of the app that you love! - Subtle layout adjustments across various sections of the app. - Corrected a minor Prev/Next bug which appeared on a handful of entries. - Unending "Loading" screen when launching app for certain iPhone / iPad users has been fixed. - Various freeze issues have been fixed. - Sharing items through Facebook should now work. - Minor layout enhancements in various sections. - Fixed a sound issue many had reported in the previous version. - Ability to customize Facebook and Twitter messages. - Removed prompt messages when 'saving' or 'removing' videos. - Archive section now broken down by month. - Cosmetic improvements to the 'search' feature. - Improved graphics for the various interface buttons. - Rectified an update problem with respect to the Home and Archived entries. - Improved audio and video quality on videos pertaining to the iPad. If you enjoy the videos wimp shares this app is great. I love that they only give us 5 videos per day. Some are funny, others educational, others boring. LOVE IT!!! Truly eclectic content. Science, ideas, human interest, humor, animals, tricks - the range is incredible and consistent. This is the place to find all the best videos on the Internet.